Just as wool formed the cornerstone of the early English economy, so was it the foundation of everyone’s wardrobe, high-born or low. The vast majority of clothing was fashioned of this extraordinarily useful renewable resource shorn from sheep. Of secondary importance was the relative luxuriousness of linen, used for under clothing. Silk, exceedingly rare and costly, was limited to the very rich, and to the burials of the sainted. 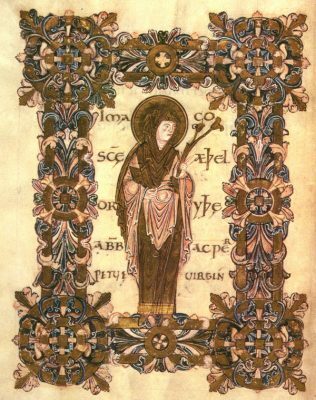 Manuscript painting offers the greatest number of illustrations of Anglo-Saxon garments, with the kings, queens, saints and clerics depicted in raiment appropriate to their respective classes. Be mindful that our surmises are thus weighted towards the luxurious tastes of the wealthy. Ivory, wood, and bone carvings, stone crosses and wall paintings provide another glimpse into prevailing fashion. Lords and ladies, thegns and merchants describe and name particular articles of clothing in their wills, and leave them to favoured heirs. Grave finds and occasional cess-pit remnants of clothing provide additional, more egalitarian sources for study. Stockings, either woven and then cut and sewn to fit, or fashioned by the single needle technique known today as nålbinding, were held up by knee garters fashioned of wool strips. Over the shift came the long woolen gown. This dress would of course vary with the wealth of the wearer. The pronounced predilection of the Anglo-Saxons for vivid colour suggests that the dyer’s art was amply employed in producing tints of blue (from leaves of the herb woad), yellow (from the weld plant), green (from club moss and greenweed), and violet (from lichen). In the 5th and 6th centuries, Anglo-Saxon women wore gowns that were simple tubes of fabric, fastened together at the shoulders by paired brooches – a style that was to persist into the 11th century with Danish women. A fabric sash or girdle was often wrapped around the waist, and was used to suspend household keys, small toilet implements such as nail scissors, ear scoops, and tweezers, and beautiful and mysterious objects such as small crystal balls and decorative spoon-like sieves, like those found in the female grave at Chessell Down, Isle of Wight. Anglian women’s graves have contained clasps of various metals at the wrist bones, apparently used to secure the sleeves. Paris has ever dictated fashion to the rest of the West, and it was no different for our fore-mothers. 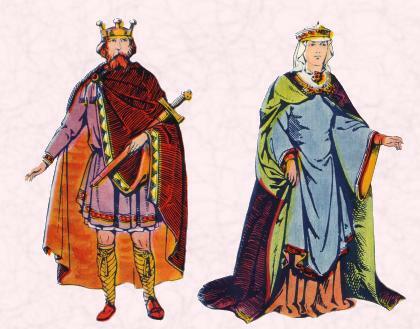 Beginning in the late 7th century Frankish fashion had a strong influence on Anglo-Saxon women’s clothing. The new gown style was ankle-length, with wide sleeves to the elbow, and was slipped on over the head. 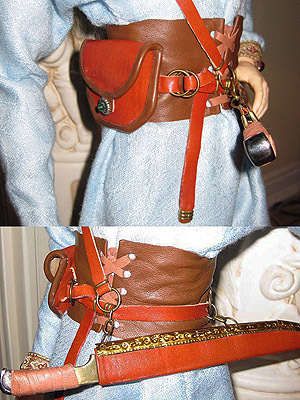 The girdle became less prominent with fewer, and more decorative, accessories hanging from it. Wide bands of contrasting colour adorn these gowns, edging the sleeves and hem and collar line, and sometimes running down the front. These may have been woven bands of wool sewn on, or broad areas of dense embroidery. In the 10th and 11th centuries the body of the gown became more tailored, and the sleeves fuller and more voluminous as the period progresses. Contrasting colour cuffs, collars and hems remained popular. Girdles are infrequent, with no loose ends trailing, and with no objects suspended from them. Cloaks changed from squares or triangles of wool, clasped with chained pins or brooches at one shoulder, to knee-length over-the-head enveloping garments. Amongst other luxurious accents, cloaks were embellished with embroidery; gold, silver, or copper wire trim sewn on; narrow coloured step weaving; and fur edging. If actual fur was out of the question, the skilled Anglo-Saxon housewife could actually create a looping weave on her loom in apparent imitation of fur or fleece. Hoods, when seen, were both individual items or integral to the cloak. Early in the Anglo-Saxon period, women wore their hair loose, plaited, or caught in snood-like nets. Simple caps are also found. By the 7th century veil-like head coverings become more popular, and Kentish grave finds suggest brooches and pins may have held these in place. Curling tongs exist, so some hair must have been meant to be seen. As the period progresses women show less and less of their crowning glory – possibly as a result of the growing grip of Christianity and St. Paul’s injunction that women keep their heads covered – so that by the 11th century a headdress nearly envelopes the head and neck in a nun-like wimple. Woman’s footwear changed least. Flat-soled ankle-height leather boots, fastened with a side over-flap with toggles or laces, were standard. As leather tanning was well advanced, perhaps these boots were dyed various colours, or worked with carved or die-struck ornamentation for the wealthy. As always, less change is evident in men’s clothing over the period than in women’s. A linen loincloth or short brief-style breeches may have been worn under closely fitting legging-like trousers of wool. A leather or woven belt held the trousers at the waist, and leather strips were sometimes wrapped around the calves to protect them. Well-to-do men wore a linen under tunic with fitted sleeves under their outer tunic of wool. A superb example of a thegn’s or nobleman’s dress has been created by the extravagantly talented E.V. Svetova of New York City (see three of her images below), who generously provides a wealth of detailed information in her re-creation. 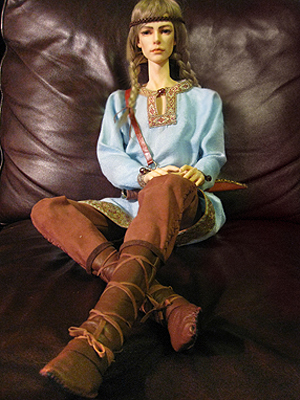 In the 5th and 6th centuries the tunic was short, thigh length, and usually sleeveless, and cinched with a leather belt. Though the 7th to 11th centuries tunics generally sported sleeves, and a wide variety of sleeve lengths are depicted, including those with long full sleeves, long tight sleeves, and contrasting coloured cuffs along with contrasting collar bands. 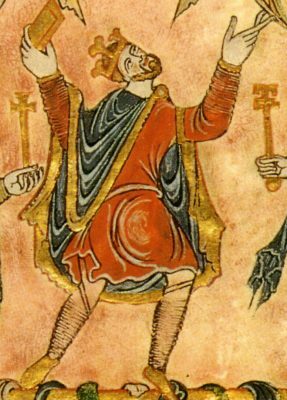 Tunics are still above the knee but beginning to lengthen, and illustrations from the 10th and 11th centuries show some very long, calf-length tunics, most especially for kings. Men generally enjoyed the freedom of going bare-headed except in cold weather when furred caps were worn. By the end of the period a tall pointed cap, with the point often shown as bent over, became fashionable. 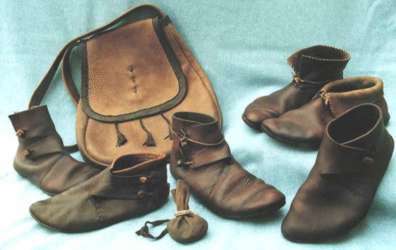 Short ankle boots with toggle or laced fastenings were the norm, and appear to be nearly identical in both men and women, though the men’s sometimes have more pointed toes. Monastic records note “wool night shoes”; these may have been warm slippers of felted wool worn to protect monk’s feet from the cold. Certainly there may have been a secular corollary. Costly gloves, richly embroidered, are mentioned by several men in their wills. Simple agricultural folk wore simple utilitarian clothing which allowed them mobility for the arduous tasks of household and farm. It would perhaps be a mistake to think that the average farm worker was awash in dull brown, gray, or even undyed wool. As most dyestuff was readily available for the picking, there is no reason to suppose the milk-maid’s gown was any less brightly-coloured than her mistress’s everyday dress. It would certainly be of coarser-grade stuff, lack costly (and time-consuming) embellishments such as elaborate embroidery, but her cloak might just as well be lined with soft domestic squirrel snared by her father as her mistress’ was with arctic fox traded by merchants. Slaves wore whatever it pleased their owner to provide for them; in Summer some must have been essentially naked save for the briefest of loin cloths or shifts. Newborns were closely swaddled and diapered in surprisingly modern appearing cloths (the square of cloth that forms the folded diaper must surely be the most unchanging article of human apparel, being thousands of years old, and the classic nappy still has not been totally supplanted by its machine-shaped disposable substitute). Children were dressed in miniature, simplified versions of adult clothing. The very rich – kings, king’s kin, archbishops – might cherish one or more garments of silk. Imported from the East at fabulous cost, silk’s ability to take and hold the most brilliant of colours, coupled with its natural shimmer, must have particularly delighted our Anglo-Saxon ancestors. Silk was worked into gowns for women, tunics for men, and most especially cloaks or hooded mantles for both sexes. Certainly such a garment would only be worn in fair weather, perhaps as part of ceremonial display, but since timber halls could be cold and draughty places, these sumptuous garments could be enjoyed indoors as well. Silk is the type of clothing most often mentioned in Anglo-Saxon bequests, for its intrinsic worth and the rich treatment it often received (gold and silver embroidery, gemstones sewn upon it) gave it singular value in the deceased’s estate. Leather was of course of immense utility for shoes and belts, but also was used for jerkins, cloaks, and leg-wrappings that served rather like protective greaves. Tanners could create a variety of charcoal, black, and brown colours during the tanning process (which inevitably employed disagreeable raw materials including all sorts of human and animal excrement) and finished leather could be additionally painted or stained with mineral pigments. Leather workers used pokers and irons to etch and burn decorative patterns, as well as dies with stamped designs. Manuscript painting, either in facsimile (or for the fortunate, in the original) is the prime source for examples of Anglo-Saxon clothing, although remember that you are generally observing vignettes from the lives of the aristocracy. Books such as The Anglo-Saxons edited by James Campbell (Penguin 1982) contain many photos of manuscript personages, along with carvings depicting clothed figures. Dorothy Whitelock’s Beginnings Of English Society (a source I never tire of citing) speaks to wills and bequests, and Dress in Anglo-Saxon England by Gale Owen-Crocker is an essential source. An earlier book by the same scholar, then writing as Gale R. Owen, Rites and Religions of the Anglo-Saxons (reissued by Barnes & Noble) contains detailed information on clothing and jewellery in grave finds. 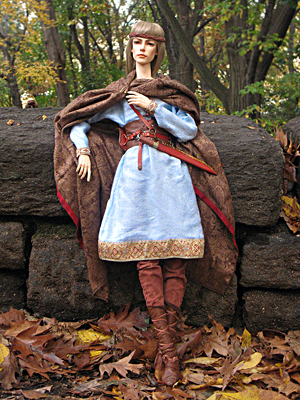 Finally, Anglo-Saxon style clothing is simple to design and sew, even for the novice. Stitching by hand lends great authenticity to seaming (you are absolved from using a bone needle) and is wonderfully calming. Purchase lightweight pure wool in colours pleasing to you and use wool thread of narrow gauge (needlepoint tapestry yarn, reduced to a single ply, is a good choice). If this seems a bother, use silk rather than polyester or cotton-blend thread. The decoration of the gown can be as elaborate as you have time for, and can be accumulatively embellished bit by bit over the years. Historic recreation societies always boast skilled seamstresses amongst their numbers, should you get bogged down and need advice, stylistic or technical. For a historically correct and beautifully realized depiction of men’s dress, see E.V. Svetova’s 7th century examples, above. Attractive brooches and other jewellery bits are readily available online, as are short boots based on the York Coppergate model and other interesting leather goods. Wear your creation at Yule celebrations and other festive occasions and be proud. Very helpful article. Looking for some good information to renew our medieval and Renaissance clothing section http://www.steel-mastery.com/en/clothing. These essays are simply wonderful! The information is accurate and presented in such a clear and easily-understood style. I am doing an essay on medieval times for my ancient history course. Your website contains a very detailed article on clothing during medieval times. To be able to use your website as a source, I need to cite your credentials in my annotated bibliography. If you could please e-mail me details about your post-secondary education, or your experience in researching history, it would be much appreciated. Thank you so much for your help, your article is very resourceful!